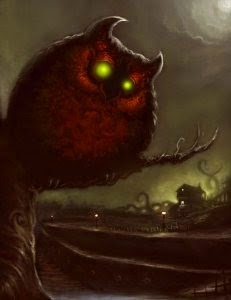 The Owlman, sometimes referred to as the Cornish Owlman, or the Owlman of Mawnan, is a purported owl-like cryptid that was supposedly sighted around mid-1976 in the village of Mawnan, Cornwall. 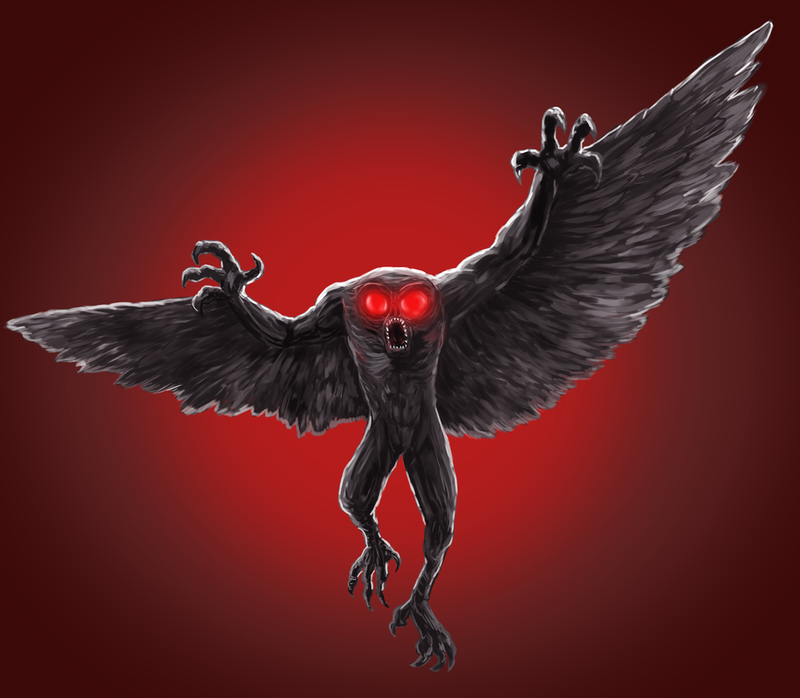 The first known encounter with the creature that would come to be known as the Owlman of Cornwall or Death Raptor as it also seems to be known, occurred on April 17, 1976. The eyewitnesses were a pair of sisters - 9 year-old Vicky and 12 year-old June Melling - who were on holiday with their family in Cornwall. While walking through the forest the sisters spied what they described as a huge winged creature hovering over the nearby Mawnan church steeple. The youngsters were so terrified by this flying fiend that they immediately ran back to tell their father, Don Melling, about the strange beast that they had seen. Melling, realizing how terrifed his children were, cut their Holiday short by three days and immediately returned home to Lancaster. This bizarre tale might have languished in the annals of strange family legends to be discussed only occasionally and in the secure confines of hom, were it not for the fact that Melling came across noted paranormal researcher Tony Shiels (known as “Doc”) in whom he decided to confide this odd account. Ever the protective patriarch, Melling refused to allow his daughters to be interviewed, but he did provide Sheils with a sketch of the beast that was drawn by June. 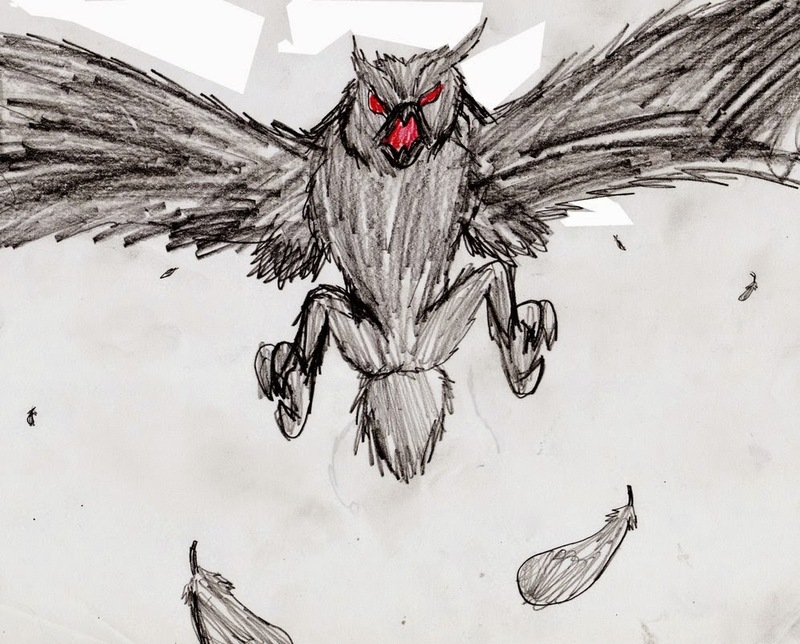 The drawing clearly showed a humanoid creature, which seemed to bear the features of an owl. ”A very weird thing happened over the Easter weekend. 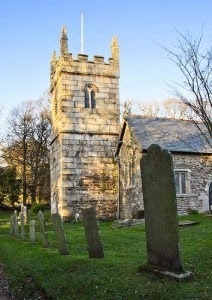 A holiday-maker from Preston, Lancs., told me about something his two young daughters had seen … a big, feathered bird-man hovering over the church tower at Mawnan (a village near the mouth of the Helford River). The girls (June 12, and Vicky, daughters of Mr. Don Melling), were so scared that the family cut their holiday short and went back three days early." Some of these weird events included strange animal attacks and multiple sightings of U.F.O's. 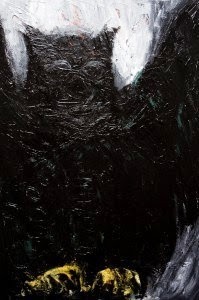 It has even been indicated by some researchers that this fiend may be from out of this world and that the description of the Owlman vaguely resembles that of another ostensibly alien creature seen in England, which has been referred to as The Bat Beast Of Kent. 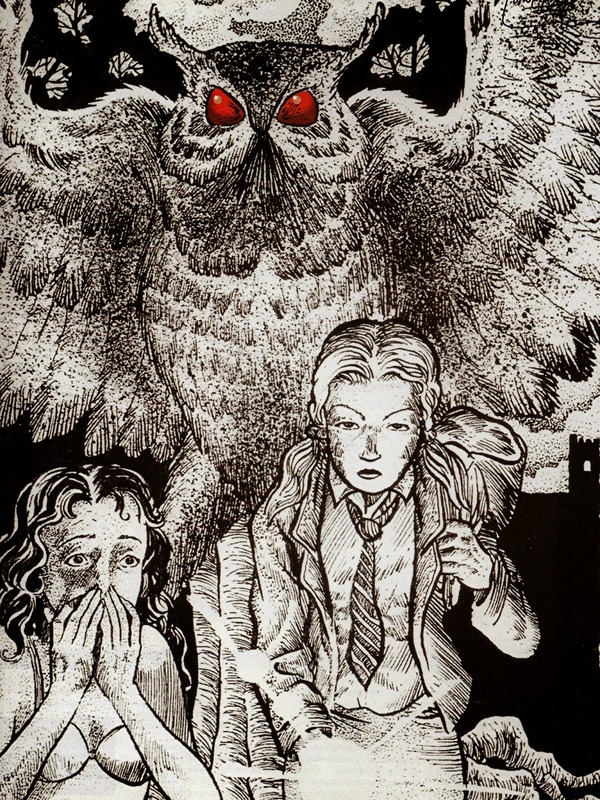 Previous to their encounter, the girls had read the pamphlet that described the Owlman's appearance to the Melling girls. They contacted Shiels, who encouraged them to draw images separately; he considered them similar enough to verify their story but different enough to rule out conspiracy. Just three months later, on July 3, 1976, 14 year-old Sally Chapman - who hailed from Plymouth - was camping with a friend, Barbara Perry, in the very same woods where Vicky and June had made their sighting. This time, however, the young eyewitnesses would not be so far removed from this shocking entity. This description of red hued eyes and grey pigmentation is reminiscent, albeit slightly, of eyewitness descriptions of a three-legged monstrosity known worldwide as the Enfield Horror, which was said to have tormented the McDaniels family in their Illinois home on April 25th, 1973. The girls, aware of Shiels involvement in the Melling sighting, wasted no time in contacting the investigator. The two girls agreed on most features with their pictures although Chapman believed that Perry had failed to accurately represent the monster’s wings. 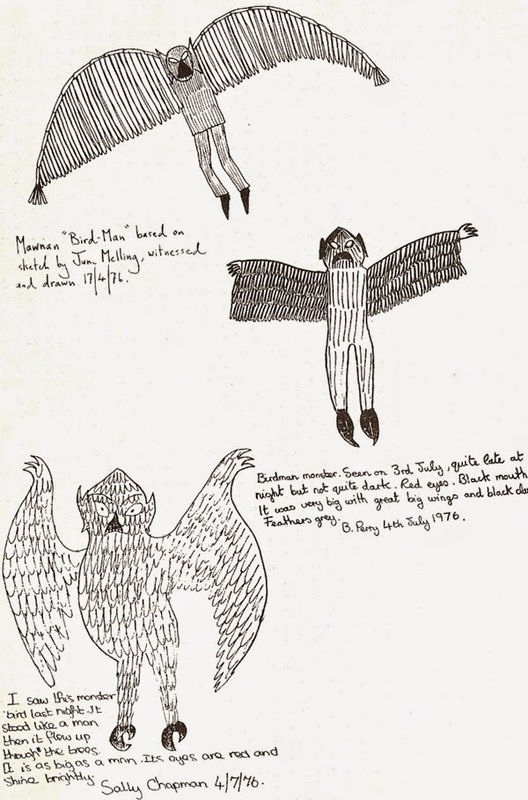 Based on these drawing Shiels would give this monster the designation of “Owlman.” It’s interesting to note that Chapman describes the creature as not only being approximately the same size as a human, but as standing like a man. 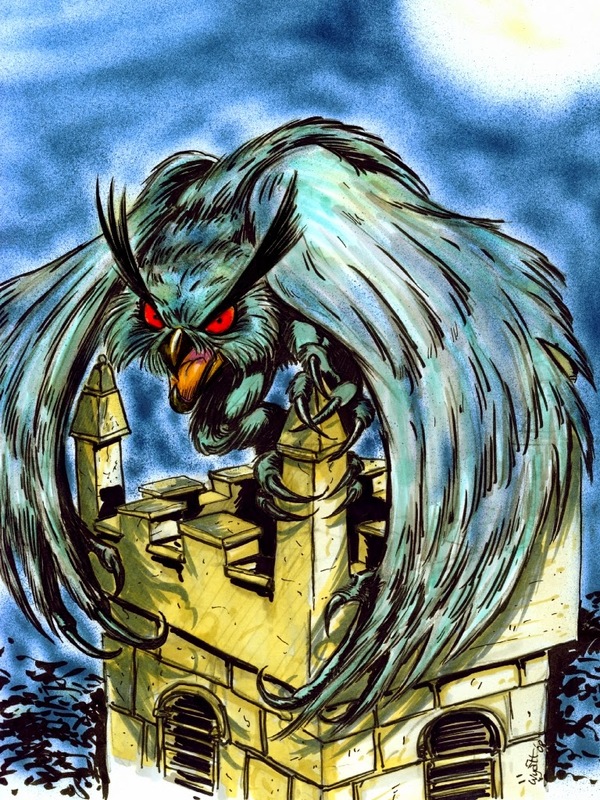 This would seem to indicate that this was not merely a large Eagle Owl as some investigators — like famed cryptozoologist, Karl Shuker — have speculated, but an actual humanoid entity. Perry’s account of a “black mouth” would likewise seem to point toward the fact that this beast is not beaked, but bears a gaping maw. The next day, on July 4th, 1976, a young lady named Jane Greenwood also claimed to have encountered the creature. 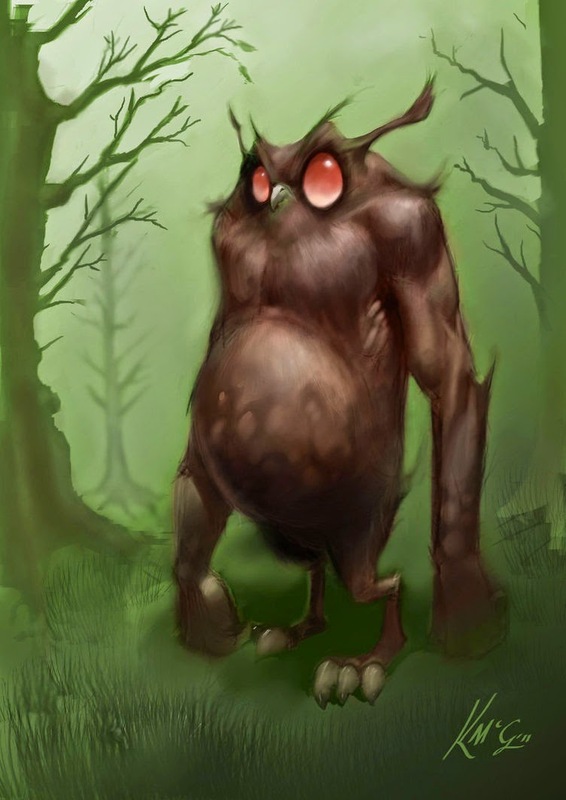 Greenwood again described the beast as being man-like, with a wide mouth, slanted red eyes and huge, black, crab-like claws. The same year, Anthony Mawnan-Peller published a pamphlet which was primarily about Morgawr, the Cornish sea monster — entitled: “Morgawr: The Monster of Falmouth Bay,” which included one of the first written accounts of the creature. Following the release of this pamphlet or, as suggested by many skeptics, because of it sightings of the beast came with increasing frequency over the next two years, but then seemed to abruptly die down. The girls like so many who have had a sighting of an anomalous animal refused to come forward and subject themselves to the ridicule or scrutiny entailed by admitting to an encounter with the unknown. According to Downes there are many investigators – such as Strange Magazine’s Mark Chorvinsky – who have questioned Shiels’ reliability in this case due to the fact that so many of the eyewitnesses came forward exclusively to him. Downes, however, has suggested that this is due to the fact that the Cornish folks are notoriously reticent to allow strangers or “outsiders” in on their potentially embarrassing secrets, and that it if Shiels had not been considered a “trusted local” this entire series of incidents may well have gone unreported. While Downes admits to being in possession of this woman’s name and address, he has respected her wish for privacy and has adamantly maintained her anonymity. While her name may be under wraps, it is difficult to dismiss the fact that as a student of biology at Chicago’s esteemed Field Museum, her testimony that this bizarre being has forced her to rethink her “world view” should not be taken lightly. 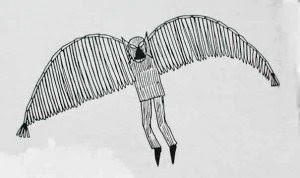 Curiously, almost all known reports of the Owlman have come from female eyewitnesses, most of who were under the age of 16. Some researchers have suggested that it is an infernal apparition from the depths of hell, others have ruminated that it may be n extra-terrestrial’s runaway pet due to the spate of UFO sightings around Cornwall in the 70's. 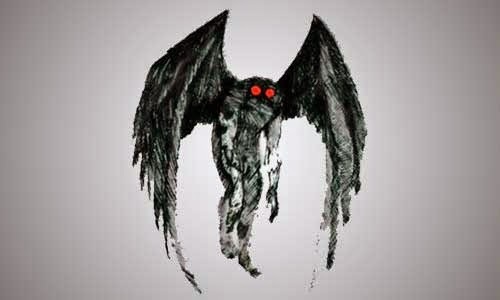 Still others have speculated that the similarities between this beast and those of the exhaustively chronicled Mothman are simply too obvious to dismiss. 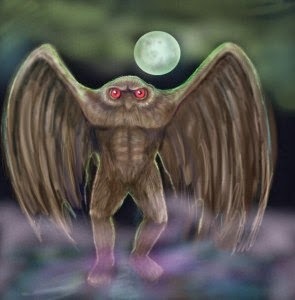 It’s interesting to note that the Owlman — unlike the infamous Mothman — does not appear to be a harbinger of doom. Nevertheless, the physical similarities between the two creatures are undeniably striking. 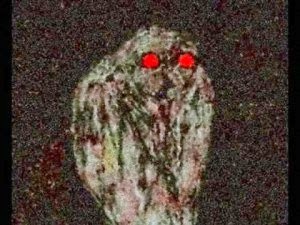 Was the Owlman a hoax concocted by Shiels or is there really something out there? We'll never truly know but personally I think it's a hoax that got out of hand.